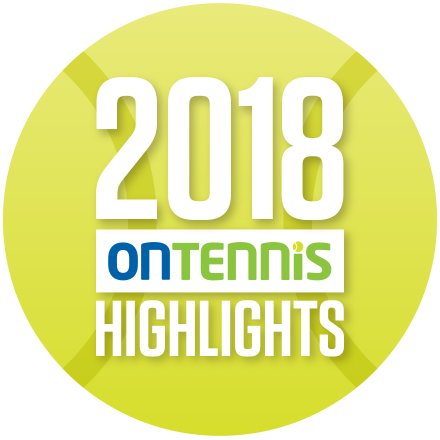 Each year, in celebration of our clubs and volunteers, the OTA recognizes outstanding contributions to tennis. Without our volunteers, the OTA would not be able to promote the sport and foster its popularity. Pictured above, Angela Kooij receives an Outstanding Club Award on behalf of Don Mills Tennis Club from OTA Executive Director Jim Boyce at the 2018 OTA AGM. Ken, a chartered accountant by profession, has had a long history of volunteering in senior and responsible positions in the Scarborough Tennis Federation, Heron Park Tennis Club and Charlottetown Tennis Club over a period of over 20 years. He was the Treasurer at Charlottetown Tennis Club in the mid 1990s, before moving on to Heron Park. During his tenure at Heron Park, first as Secretary in 2005, then as Treasurer from 2006-2013, Ken was always supportive of the club's goals and activities, and was always willing to assist whenever necessary, including assisting with the festivities for the club’s 50th anniversary in 2009. Ken is serving his 14th term as the Vice President of Finance for the Scarborough Tennis Federation as of 2018, a position he has served under 5 different Presidents, and he is the second longest serving member of the STF Executive. As Vice President of Finance, Ken has been responsible primarily for preparation of the STF’s annual budget and financial statements, disbursing STF funds to pay for budgeted expenditures and maintaining STF banking records. Ken continues to be an outstanding volunteer at the club and regional level and is most deserving of the Association’s highest award. Agnes has been a strong advocate of tennis and in recent years a strong advocate of senior tennis at Brampton Tennis Club and still up to today, continues to promote tennis activities. Because of her contributions, the club remains a top performer in Ontario for the Plus 55 league. Thirty years ago, Agnes became involved in the management of the Inter-County Tennis Association (ICTA). First serving as a Ladies Division Chairperson, then 10 years later, she became the ICTA Vice President. The ICTA started with one Major division of 8 teams 45 years ago and now has about 300 teams. In 1996, Agnes developed the Plus 55 League and found a niche for her and other seniors. In 1998, she became the ICTA President and spent the next 6 years developing their web site. As the ICTA Past President, the position of Juniors League Director was unfilled so she stepped in and added the Juniors Mixed League (World Team Tennis format) on Sundays. It has proven to be an effective alternative and continues to flourish at a Major and A level. Agnes is an exemplary volunteer and most deserving of this award. Mary Soye and Jon Cabell, (centre) receive an Outstanding Club Award on behalf of West Rouge Tennis Club from OTA Executive Director Jim Boyce, left, and OTA Club Membership Manager Jay Neill, right, at the 2018 OTA AGM. Jack Dinardo, (centre) receives an Outstanding Club Award on behalf of Gwendolyn Park Tennis Club from OTA Executive Director Jim Boyce, left, and OTA Club Membership Manager Jay Neill, right, at the 2018 OTA AGM. Lisa Fung, (centre) receives an Outstanding Club Award on behalf of Newmarket Community Tennis Club from OTA Executive Director Jim Boyce, (left) and OTA Club Membership Manager Jay Neill, (right) at the 2018 OTA AGM. The Bruce Childs Volunteer Awards are provided to OTA member clubs to help them recognize volunteers who have made a significant contribution to tennis at the club level. In 2017 the following clubs recognized the listed people with these awards.